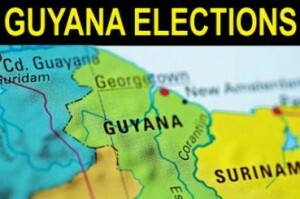 November 28general elections in Guyana have resulted in a crisis for the country. While it is being suggested that the elected President, Donald Ramotar, of the Peoples Progressive Party/Civic (PPP/C) can appoint and run a minority government, it is an unrealistic proposition. Ramotar was elected President by a plurality of the votes but the PPP/C failed to get an overall majority in the National Assembly. The complex Guyana constitution provides for an electoral system of proportional representation under which the country is divided into 10 regions returning 25 members of the National Assembly and another 40 being allocated nationally on the proportion of votes cast for a party. To control the National Assembly, a party must secure more than 50% of the votes cast. However, the President in whom executive authority lies, according to the Constitution, only requires a plurality of the votes to be elected. Thus, since the PPP/C got the highest number of votes cast for a party (48.7%), Ramotar is elected President but the PPP/C as a party does not control the National Assembly which makes the laws of the county and initiates its money bills, including the Budget. Of the 72.9% voter turn-out at the poll, the three opposition parties combined secured 51.3% of the vote. The breakdown is: 40.8% for A Partnership for National Unity (APNU); 10.3% for the Alliance for Change (AFC) and 0.2% for the United Force. Even if the three opposition parties were now to form an alliance – something they failed to do before the elections – they cannot form a government. Under the Guyana constitution, the President appoints the Prime Minister and Ministers of the Government from “among the elected members of the National Assembly”. There is no requirement for him to appoint persons to form the government from among a party or parties that command the majority in the National Assembly. This has to be the worst nightmare for any President, but it has to be particularly harrowing for Ramotar who has no experience of government, except as a member of the National Assembly for the PPP/C of which he has been general secretary over the last few years. As this commentary is being written (shortly after the announcement of the election results on Thursday), it has been reported that Ramotar will try to operate a minority government. In other words, he will appoint a government from among PPP/C elected members only. This would not be a sensible proposition. For, if the opposition parties in the National Assembly decide to work together they would defeat any legislation including a Budget which the government would require to function. In such a circumstance, Government would be crippled, and the only resolution of the problem would be fresh elections in an effort for one party, or an alliance of parties, to secure an overall majority. It is ironic that had the AFC joined the APNU alliance that comprises the Peoples National Congress (PNC), founded by the late President Forbes Burnham, and the Working Peoples Alliance (WPA) founded by the late historian Walter Rodney, the combined parties would have won both the Presidency and the overall majority of the National Assembly. In this sense, they have only themselves to blame for their failure to topple the PPP/C. But more importantly now is what happens going forward. Ramotar and the PPP/C have a rare and golden opportunity to retrieve Guyana from its long history of racial and divisive politics by recognising that the majority of the people of the country did not support them at this election notwithstanding the economic success they have achieved in the last few years. Other issues played a much larger role and those issues included a perception of neglect of disadvantaged communities by the PPP/C including sugar workers of East Indian descent; marginalisation of Guyanese intellectuals of African descent who have been excluded from top government positions; and a general view that high PPP/C officials had benefited hugely from their time in government. Good sense should prevail in this very troubled situation and Ramotar should make every effort to talk to the leaders of the two main opposition parties to form a government of national unity. It would be the best thing for Guyana, and it would ensure that prosperity and stability can be built on its recent economic success and the definite prospects for immediate and continuous economic growth as a result of recently signed contracts for the mining of gold, bauxite and manganese, expected to earn the country billions of dollars, as well as the real possibility of oil production. The future for the Guyana economy and the Guyanese people could be glowing if such a course is followed. If it isn’t, then Guyana and the Guyanese people will be headed for great political instability, social unrest and a major reversal of their recent economic good fortune. At the same time, if Ramotar and the PPP/C reach out a hand of co-operation to the APNU and the AFC the two latter parties also have an obligation to accept it and to sit down to work out the mechanics of a government of national unity that could secure Guyana’s future. If ever there was a time in the tides of a country’s fortunes that requires its politicians to put their narrow political interests to one side for the greater interest of the nation, that time is now. The vast majority of people of Guyana are now frightened and worried. The country’s political leaders have the chance to turn that fear and worry to relief, hope and confidence. Guyana, at last, could begin to realise the potential it has long held out. Other leaders in the Caribbean and the world should call on Ramotar, and the leaders of APNU and AFC not to condemn their country to ruin and their people to the rack. History is in their hands.